COLUMBUS — J.T. Barrett doesn’t like to lose to anyone. Losing to someone twice? That’s even worse, least of all if that someone isn’t even in the stadium. After Ohio State’s 38-7 win over Army on Saturday, Barrett said one of the things that drove him after last week’s defeat at the hands of Oklahoma was not letting that disappointment carry over to this week. “We don’t lose a lot of games here. I wasn’t happy with the way I played. But you have to move on otherwise if you keep on holding on to a loss you’ll let Oklahoma beat you twice,” the senior quarterback said. Barrett and No. 9 Ohio State (2-1) found some redemption in their win over an over-matched Army team. He completed 25 of 33 passes for 270 yards and two touchdowns on a day when the Buckeyes produced some big plays on the ground and in the air. Freshman running back J.K. Dobbins rushed for 172 yards on 13 carries and had a touchdown run of 52 yards and another 36-yard run. K.J. Hill had 8 catches for 74 yards. And Barrett went into the Big Ten record books by passing Drew Brees for the most touchdowns produced, passing and run, with 107 in his career. The record breaker came on a 9-yard touchdown pass to Austin Mack in the fourth quarter. Barrett had been the focus of much of the criticism OSU faced after its 31-16 loss to Oklahoma, but he shrugged it off and didn’t let it affect his performance. “Being the quarterback you get a lot of praise when you win and then when you lose you get all the blame. I’m OK with it,” he said. Ohio State coach Urban Meyer said, “Of all the great players that have played here, to say you’re the No. 1 touchdown maker in the history of the Big Ten Conference, that’s awesome. That’s going to be a hard one to break. He’s got a lot of games left. “He has the heart of a lion. And he has toughness. He’s one of the toughest players I’ve every been around. Those are pretty good characteristics to have with a guy touching the ball every snap,” he said. Ohio State scored the first two times it had the ball on drives of 75 yards in eight plays and 94 yards in 13 play. The big play in the Buckeyes’ first drive was a 36-yard run by Dobbins and the touchdown came on a 5-yard run by Barrett with 12:23 left in the first quarter. During the second drive, Barrett connected with Hill on pass plays of 17 yards and 15 yards and found Austin Mack for an 18-yard completion. A two-yard touchdown run by Dobbins gave Ohio State a 14-0 at 4:11 of the first quarter. Army responded with a 99-yard drive that started with 1:03 left in the first quarter and took up the first 8:34 of the second quarter. Darnell Woolfolk’s three-yard run at the end of the drive cut the lead to 14-7. Sean Nuernberger’s 33-yard field goal increased OSU’s lead to 17-7 at halftime. Dobbins’ 52-yard touchdown run on Ohio State’s first possession of the second half made it 24-7. A 20-yard Barrett to Terry McLaurin touchdown pass pushed the lead to 31-7 after three quarters. OSU’s final score, which came on Barrett’s record-breaking pass, made it a 38-7 game. Ohio State had 586 yards total offense – 316 yards passing and 270 yards rushing. Army (2-1) had 278 yards total offense, all but 19 of it rushing. Ohio State’s K.J. Hill tries to shed Army’s Cole Christiansen during Saturday’s game in Columbus. Ohio State running back J.K. Dobbins looks for running room during Saturday’s game against Army in Columbus. See more game photos at LimaScores.com. 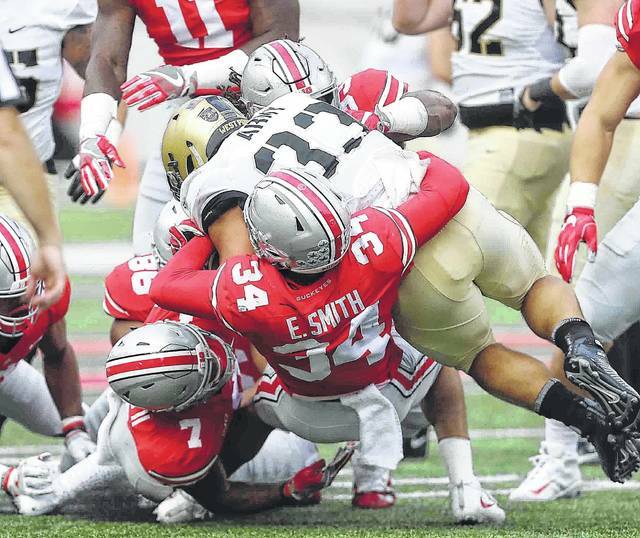 Ohio State’s Damon Webb (7) and Erick Smith (34) combine to stop Army’s Darnell Woolfolk during Saturday’s game in Columbus.